SMN: Your gold is more of an insurance policy against government manipulation and/or a collapse? 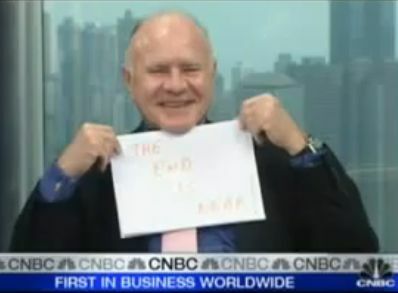 Marc Faber : I’m aware of some people, including Eric Sprott, that believe that there is manipulation in the system. Where I tend to agree with him is that maybe central banks don’t have all the gold they claim they have, because something must be funny. The Germans have asked for the gold to be returned to Germany. Why would it take eight years to do that? There’s no reason. You can do it in three months. As I said, I don’t know, but one of the reasons I would be inclined to believe in some manipulation would be, let’s say you’re a central bank, like the Fed. You don’t have the gold that you declared and you know that you have to buy it back at some point. Then, you may wish to manipulate the price down until you can cover your short position in gold at a reasonable cost. There will still be losses, but you can cover them at a reasonable cost. That is really the only reason I could see why a central bank would want to depress the price of gold.